Love Spanish wines? How about Spanish food? Maybe you just want to learn more about both by experiencing them firsthand. Your chance is less than a month away to do so! 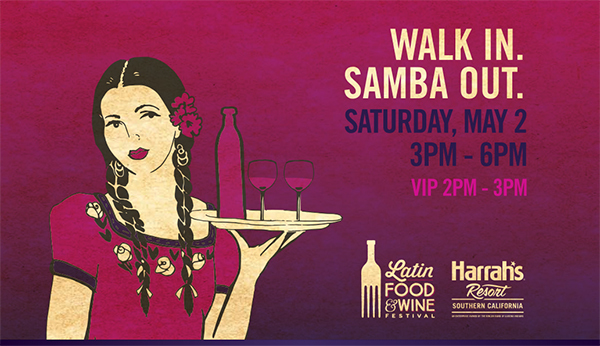 Harrah's SoCal is hosting the 2nd Annual Latin Food & Wine Festival in the afternoon of May 2nd, and tickets are still available. Celebrate Spanish wine and Latin cuisine with Celebrity Chef Javier Plascencia that Saturday while enjoying live entertainment via Spanish guitar with flamenco dancers, Cumbia, Latin Pop, Mariachi, and Latin Jazz. More than twenty wineries will be present starting at 3PM (VIPs get in on the action at 2PM) for attendees to taste from as they explore the history of California's involvement with Latin wine. Several local restaurants will also be commemorating the theme with Spanish dishes or Spanish-inspired dishes, and live entertainment will keep all excited about the festival. If you are interested in keeping up-to-date on everything happening from now until the festival, make sure to check out their Facebook event page and let others know about it. Several options of tickets are available so that many different types of guests can enjoy the festivities. Designated Driver tickets are $30 (unlimited restaurant tastings and non-alcoholic beverages), General Admission are $75 (unlimited winery and restaurant tastings and commemorative glass), and VIP are $150 (hour of private access to all the wineries, private celebrity chef demonstration and tastings, a commemorative gift, and seating in the VIP lounge). They are available on Ticketmaster or by calling 1.800.345.5300. If you plan on going, let us know so we can say hello! Both Duc and I will be present, making sure we get our exposure to all that the highly-anticipated wineries and restaurants will have to offer. The festival takes place at Harrah's Resort Southern California located at 777 Harrah's Rincon Way, Valley Center, CA 92082.